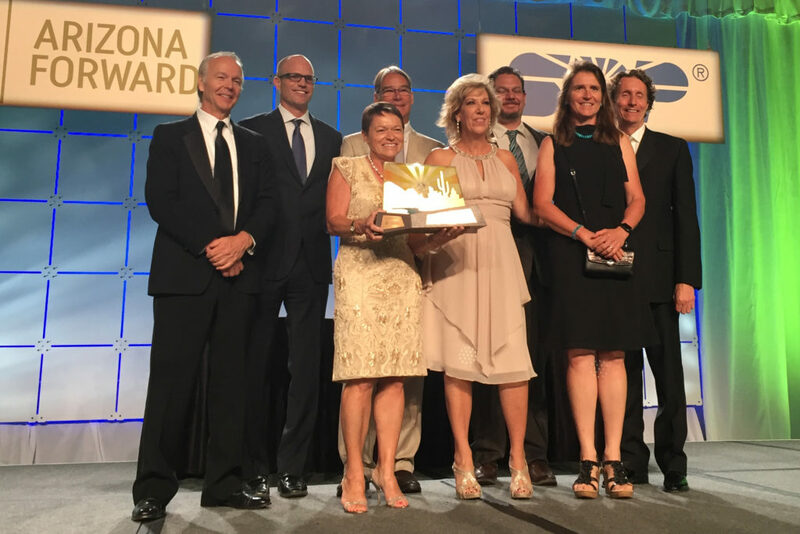 Deemed a “building of the future,” Northern Arizona University’s International Pavilion earned the coveted President’s Award (Best of Show) and the Crescordia Award in the 36th Annual Arizona Forward’s Environmental Excellence Awards presented by SRP. Jurists praised the facility as among the greenest building of its kind in the world. More than 600 community leaders throughout Arizona attended the awards ceremony, which took place Saturday, Sept. 10, in Phoenix. The judges, which included a number of federal, state and local dignitaries, evaluated the nearly 100 nominations from Coconino, Pima, Pinal and Maricopa counties on innovative initiatives that demonstrate green design, protect natural resources and build in harmony with the environment. More than a dozen awards were given out in various categories; ranging from sustainable communities to art in public places. “We are proud of what we are accomplishing at Northern Arizona University and this recognition is an affirmation of our efforts. The International Pavilion is a point of pride on our campus and is a home away from home for the record number of international students we welcomed to campus this year,” President Rita Cheng said. Upon completion in 2015, the International Pavilion received a LEED Platinum certification—the U.S. Green Building Council’s highest honor. In addition to the 35-kW solar panel array on the roof, the building’s use of natural airflow, absence of traditional mechanical air units, efficient radiant heating solution and enhanced approach to daytime lighting has helped it achieve net-zero energy use. Students at NAU helped contribute to the construction of the International Pavilion by providing dollars through the NAU Green Fund—a student fee that allocates funding to environmentally-conscious projects through a competitive process. NAU also received Awards of Merit in the Building and Structures Commercial and Institutional category for the Student and Academic Services Building and in the Energy and Technology Innovation category for Campus Dining’s composting project.